Enjoy Life Foods offers allergy-friendly products, including cookies, snack bars, seed and fruit mixes, baking chocolate, chocolate bars and snack chips. Enjoy Life Foods, “ELF”, engages Anvil for SEM and SEO services. These disciplines must work together to grow ELF’s online presence while avoiding cannibalization of each other’s performance. At the end of Q3 2016, organic traffic for branded terms began decreasing while demand for the “brand” paid campaign increased, causing the budget to become limited. Anvil’s Organic Search team provides keyword optimization for new blog posts and recipes that are being consistently added to the Enjoy Life Foods website. The team then monitors SERP ranking and reports on site traffic. Anvil’s Paid Media team manages search and display campaigns, combing through SQR and monitoring keyword quality scores to maximize performance and identify trends. Through this monitoring Anvil identified that the overall search volume for ELF’s brand had remained steady and therefore the increases seen in paid search demand was directly related to the decline in organic traffic. In light of this, in November Anvil’s Paid Media team opted to shift funds away from the “brand” campaign towards other non-branded campaigns where organic ranking was low. This allowed ELF to appear in more search results, as either an organic listing or an advertisement. Traffic to the Enjoy Life Foods website increased in both organic and paid search in December 2016. 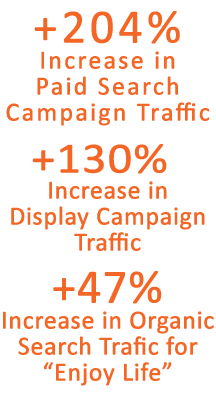 Organic search’s traffic focused on branded terms while paid traffic saw impressive growth in unbranded traffic.